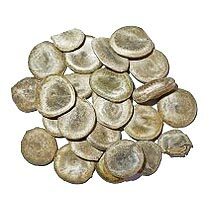 We are a well-known Nux Vomica Seeds Exporter and Supplier in India. In the Indian (Ayush) system of medicine, "hudar" is the mixture containing Strychnos nux-vomica and used to elevate blood pressure. The seeds are first immersed in water for 5 days, in milk for 2 days followed by their boiling in milk. In India, the quality/toxicity of traditional medical crude and processed Strychnos seeds can be controlled by examining the toxic alkaloids using established HPLC methods and/or HPLC-UV methods.